A chance discovery of a trunk of documents reveals the story of the Eddisons, a Quaker family who lived for five generations in the village of Gateford, Nottinghamshire. The book tells of the life of Edwin Eddison, a lawyer, who, from early childhood, was plagued with a mysterious illness which never departed from him. He visited the leading doctors of the day whose treatments did more harm than good and their methods make gruesome reading. Edwin's youngest brother, Benjamin, lived and farmed nearby at the beautiful, battered Shireoaks Hall. Eddison relations, the Booths, from Annesley Woodhouse, were involved in the stocking industry and narrowly avoided alarming Luddite disruptions that were prevalent in the area. The Reverend Abraham Booth, (an owner of stocking frames) wrote the celebrated book, The Reign of Grace. An early protester against slavery, he declared that the European slave trade was theft. Childhood letters give a lively picture of Georgian farming life in Nottinghamshire. Edwin Eddison's grandfather impressed his friend, the agriculturalist Arthur Young, with his innovative farming methods, one of which included a method of improving bog land around Gateford with a matted network of twitch grass. 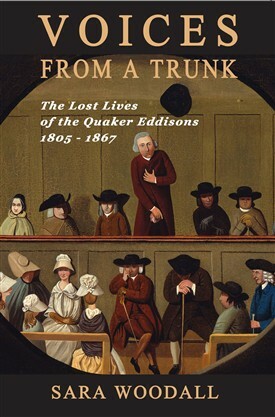 Edwin and his brothers travelled by coach to attend Tatham's Quaker boarding school in Leeds – their strict rule book was found in the trunk along with their homesick letters. Quakers were debarred from taking degrees at the principal universities, so they often went straight from school at a young age into practical apprenticeships in family businesses. Science was considered a safe subject for Quakers who were urged to study nature as a way to involve them with the inscrutable ways of the Creator and this led them to botany, farming, medicine and experimenting with minerals. The forced exclusion of Quakers from the universities partly explains why so many of them were in trade and industry but does not explain why they did so well. In 1800 when many of the Quaker businesses began their growth, only one person in 500 was a Quaker. It has been calculated that the foundations of a large percentage of Britain's Industrial Revolution were laid by just 0.2 percent of the population - many were Quakers. The book describes Quaker involvement with the birth of the railways and the invention of the steam plough by John Fowler of Leeds, who, after a traumatic visit to famine-struck Ireland with his father and other Quakers, wanted to ease the dreadful situation. The successes of Quaker steel and ironworks, pharmaceuticals firms, chocolate and biscuit manufacturers and other industries, caused money to pour into Quaker banks. The chapter on the great Overend and Gurney Bank crash in 1866 echoes the banking problems of today. After retirement, Edwin and his family embark on an enterprising but doomed trip to America and their letters home give vivid accounts of the country which was newly recovering from the Civil War.